Compassionate Nursing Services shares details on the most common vision problems for seniors. If your older loved one has received a diagnosis of age-related macular degeneration, you’ll likely be faced with a variety of questions and concerns. And you’re not alone; a staggering 11 million people in the U.S. have received the same diagnosis, and that number is predicted to double by the year 2050. Compassionate Nursing Services, experts in home health care services in St. Louis, MO, is here with the details you need to better understand this condition and how to best help your senior loved one. Age-related macular degeneration (ARMD) is a disease whereby the center of the retina (the macula) is damaged, influencing central vision and the details necessary in reading, driving a car, watching the television, and recognizing other people’s faces. It is the leading cause of permanent central vision blindness in older adults, affecting about 30% of adults over age 75. It’s important to be aware that macular degeneration will not traditionally cause complete loss of sight; peripheral vision stays unaffected. Wet ARMD: Accounting for up to 20 percent of all diagnoses, wet age-related macular degeneration creates a build-up of drusen – fat deposits – and an irregularity of the blood vessels underneath the retina. Both of these problems together bring about retinal damage. Wet ARMD can advance swiftly and lead to severe and irreparable central vision loss. Dry ARMD: Dry ARMD accounts for the majority (up to 90%) of macular degeneration diagnoses. As with wet ARMD, drusen develops below the retina, resulting in a thinning of the macula and eventual central vision loss. Advancement is more gradual in this kind of ARMD, but it can progress to wet ARMD. In both kinds of ARMD, early diagnosis and continuous monitoring are vital to preserving remaining vision. 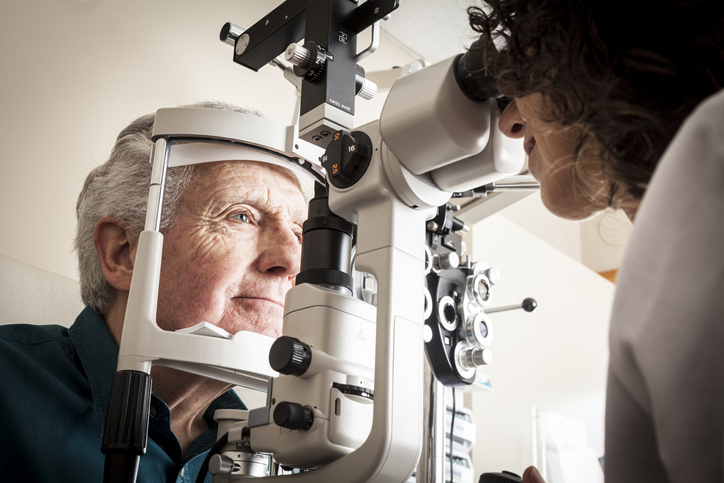 All older individuals need to get eye exams at least yearly. To spot ARMD, the eye doctor will dilate the eyes and perform a fundoscopy, fundus photography, and a visual acuity test. If ARMD is suspected, an additional assessment, a fluorescein angiography, will probably be necessary. In this test, dye is injected to recognize any leakage in the blood vessels. The Amsler grid eye test is a quick and simple tool that can also be used at home as an initial step in finding out if ARMD might be a possibility. What options for treatment are possible for ARMD? Putting into practice healthy lifestyle decisions, such as stopping (or not beginning) smoking, regularly exercising, adhering to a nutritious diet that includes an abundance of vegetables, fruits, and fish, sustaining a healthy weight and normal blood pressure, and wearing eye protection when outdoors, including sunglasses and hats, could help lessen the chance of developing ARMD. For a trusted partner in care for a senior with macular degeneration to provide help with transportation, medication reminders, meal preparation, light housework, and much more, contact Compassionate Nursing Services, provider of the top home health care services in St. Louis, MO, any time at 314-432-4312.